Last week, something wonderful happened. I went grocery shopping at Meijer and found almond butter on sale for $4.99 and yes, that's still expensive for a nut butter—but it's super cheap for almond butter. Being the almond fan that I am, and having always wanted to try almond butter, I picked it up. And hoo, boy! I'm glad I did. 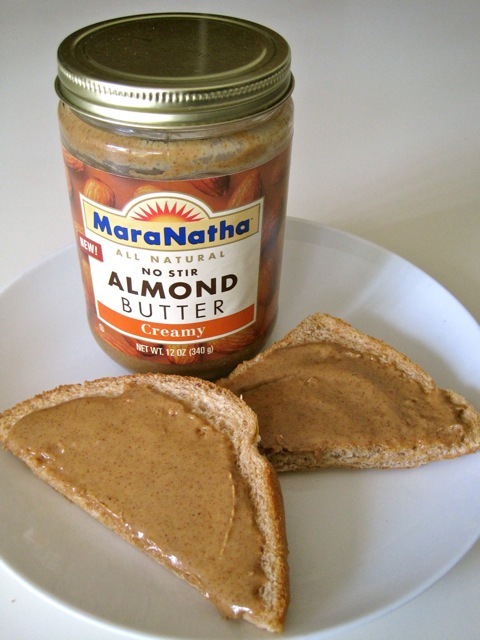 Though I still love peanut butter, I love LOVE almond butter. Same texture, slightly sweeter and jam-packed with traditional almond health benefits. When eaten moderately, almonds (as you may already know) are a great addition to any healthy diet. So long as you don't have nut allergies, of course. They're full of protein and fiber, both of which help keep you full for longer. They also contain polyunsaturated and monounsaturated fats. "But aren't we supposed to cut out fats?" That's what they say, but unlike saturated and trans fats, poly and mono fats put up a good fight against high cholesterol and heart disease. So they're generally acceptable in small amounts. But be warned, almond butter is so good it's hard to keep your serving size acceptable! Like peanut butter, it's quite delicious on bread, apples and in smoothies. Or even by itself on a spoon. This MaraNatha brand is the only variation I've tried so far, though I see many on the shelf. I did, however, manage to snag some from Trader Joe's this weekend while I was in the city. So if you're blessed with a Trader Joe's nearby, pop in for a jar. It was only $3.99! And if you know of another brand that's simply fabulous, please let me know so I can give it a go! Trader Joe's Crunchy Almond Butter gets my vote!